It is an interesting article that I got it from Anggugu! 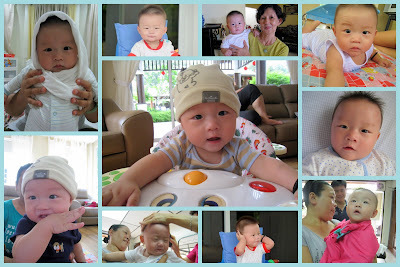 How is the 4th months old Ethan doing? He is doing extremely great! We are so proud of his progress! He begins to love his shower times. He bathes twice a day. Whenever u took him out from his bathtub, he will sure make lot of complaints! Besides, he has refused to lie down nowadays. He wants to be in sit up position so that he can survey the world. 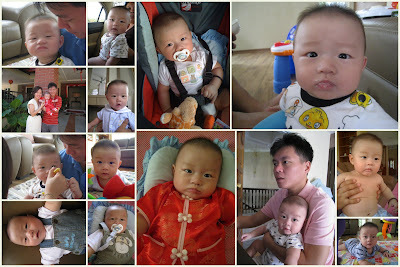 Of course, this playful boy likes to giggle & wiggle especially when his PoPo plays with him. It is definitely a joy to see the changes on him. He is on bib because he drools so often. Has the white thingy teeth start to grow yet? It is PoPo's birthday! Ethan is happily cradled by his Ah Toh. It's PoPo's 80-Years Old birthday. The celebration is held at Klana Hotel, Seremban. Happy Birthday, PoPo & Ah Toh! Ethan is coming to the 4th month next week. I'm also impress that I'm still breastfeeding him. I was quite worried that I couldn't cope with the breastfeeding schedules once I started my work. Luckily, with the support from Hubby & also my determination, I managed to do it successfully. I did think of given up initially due to few reasons. Firstly, I do not have the luxury to enjoy my lunch with my buddies anymore. I have to rush back home to express my milk or express it at the breastfeeding room in the hospital. Hence, normally I will opt for a heavy breakfast so that it could last me till the next meal. Secondly, I also have to wake up every 6am to express my milk before I prepared myself to go to work. So my rest times are quite short actually. Thirdly, with my recent job, I am even more tiring. With the stress & assignment given, I am exhausted. I dozed off easily. Anyway, I'll just have to put all these aside. To tell you the truth, I feel a sense of satisfaction when I see my little one is growing healthily each day. So, I'll never give up breastfeeding Ethan at the moment. Hurray Mummy!